A multisig address is used. 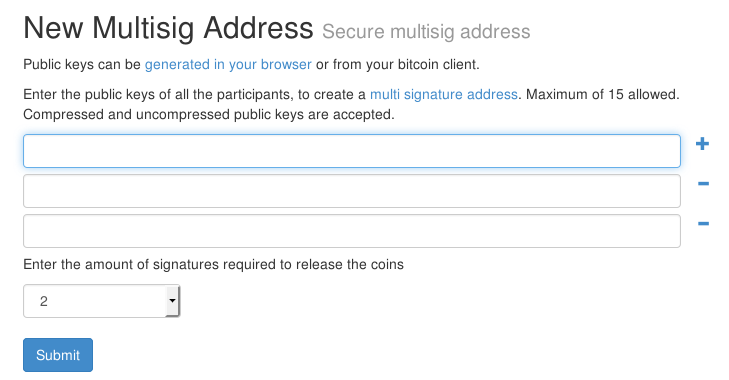 Debiting the multisig address needs several signatures. Popular multisig address types are 2/2 and 2/3. Debiting a 2/2 multisig address needs 2 signatures of 2. Debiting a 2/3 multisig address needs 2 signatures of 3. The buyer and the seller create a multisig 2/2 address and move their money to it. None of them can get his money back without approval by the other party. After this the deal itself is carried out (let it be a purchase of goods or a provision of services for bitcoin). If the deal succeeds (the buyer gets the goods and the seller gets the money), the parties of the deal take the money back from the deposit. If a conflict occurs or one party just disappears, they both lose the money deposited. Each party depends on the other. The risk of losing money is a greater deterrent to dishonesty, than is general law. Some people accept penalities for violation of the law, but no one wants to lose money. The loss of money is the most powerful economic argument. It makes no sense to cheat if it obviously leads to losses. In order for this method to work, the deposited money must exceed the price of the goods. Otherwise the party getting the goods or the money first, can pull the plug on the deposit and disappear. It is best if each party deposits double the price of the goods. With bitcoin, money is deposited from both parties by one bitcoin transaction. This means that either both parties deposit the money or none of them deposits. This prevents dishonesty or trickery by one of the parties. Price of the goods is 1 BTC. Each party deposites 2 BTC. Alice and Bob create common multisig 2/2 address to be used as deposit storage. Alice and Bob sign the transaction, moving 2 BTC from Alice’s wallet to the multisig 2/2 address and 2 BTC from Bob’s wallet to the multisig 2/2 address. Alice provides services to Bob. Bob pays 1 BTC to Alice. Alice and Bob take the money back from the deposit. This algorithm is a wrapper for any deal. The overhead is only fees of 2 bitcoin transactions (to and from deposit). 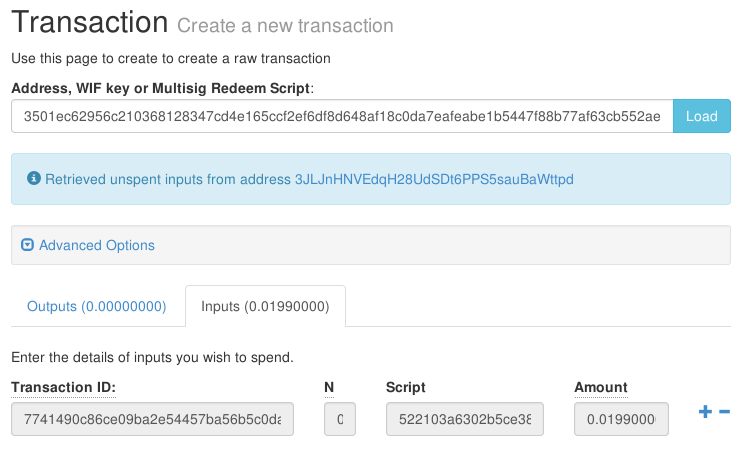 If transactions refilling personal wallets are counted as well (see below “Preparation”), then the final fee is four transaction fees (0.0004 BTC). If the deal includes a private meeting, then moving the money to and from a deposit can happen before and after the private meeting. Moreover, participants of a private meeting feel better if they are bound by the deposit instead of being just strangers. The method described works well for distant deals as well (e.g., a person from one country sells an intellectual product to a person from other country). Several consequent deals may happen “inside” one deposit. Whereas the graphical tools Bitcoin-qt and Electrum do not provide a convenient interface to carry out two transactions needed, the Web client Coinbin based on BitcoinJS does provide it. The client doesn’t depend on the developer’s server and doesn’t store cryptographic keys remotely, so it doesn’t require to trust third parties. Furthermore, Coinbin can be downloaded and used locally or uploaded to one’s own server. E-mail and passwords are used as seeds for key generation. To posses multiple addresses, use several pairs (E-mail, password). Backup your E-mail and password to prevent loss of access to the wallet. KeePassX is a good place for this. Alice and Bob create Coinbin wallets (pic). See keys, backup private keys, tell each other their public keys and addresses (pic). 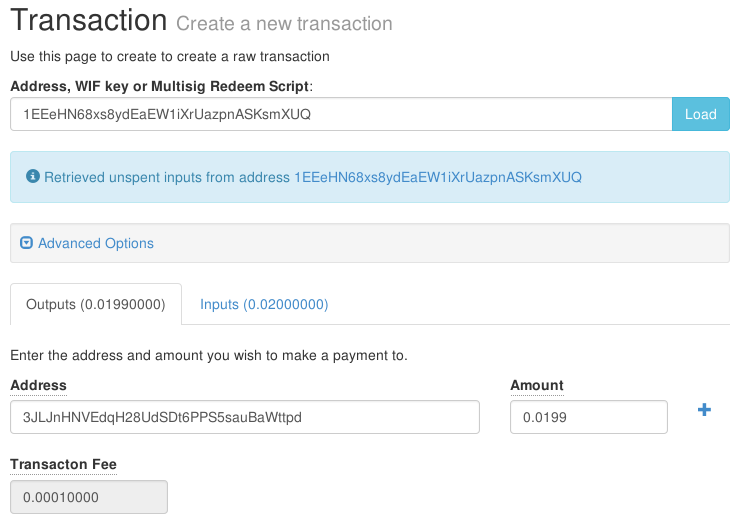 Send the money to be deposited to Coinbin addresses (0.01 BTC from each of them) (pic). Finds MultiSig Address in Coinbin menu (pic). The form is shown. Fill the form with public keys of her’s and Bob’s (pic). Backs up resulting address and Redeem Script and sends them to Bob (pic). Selects Verify in Coinbin menu (pic). 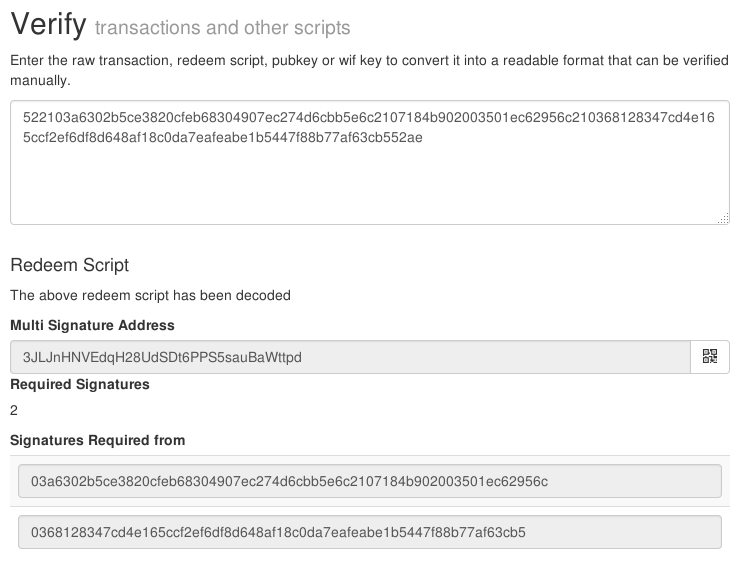 Enters Redeem Script and compares public keys, address and that Required Signatures = 2 (pic). Clarification: Bob knows his public key and Alice’s public key sent to him previously. He gets the address of multisig 2/2 along with Redeem Script. Required Signatures is the number of signatures required for debiting multisig 2/2 address, so it is 2. 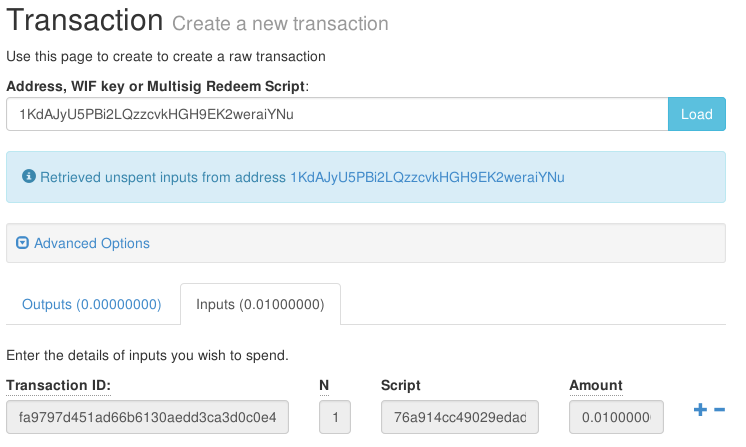 Selects Transaction in Coinbin menu (pic). Goes to Advanced Options, unchecks Clear existing inputs… (pic). Enters first paying address (Alice’s) as an Input (pic). Enters second paying address (Bob’s) as an Input (pic). Enters multisig 2/2 address as an Output. 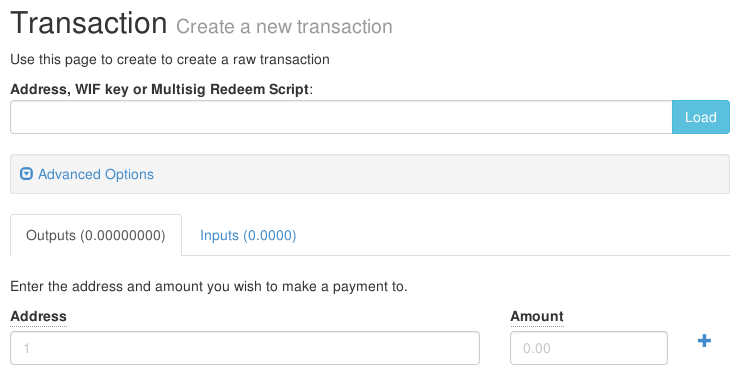 Amount of money is sum of inputs minus bitcoin transaction fee (pic). Gets Transaction Script and sends it to Bob for verification (pic). 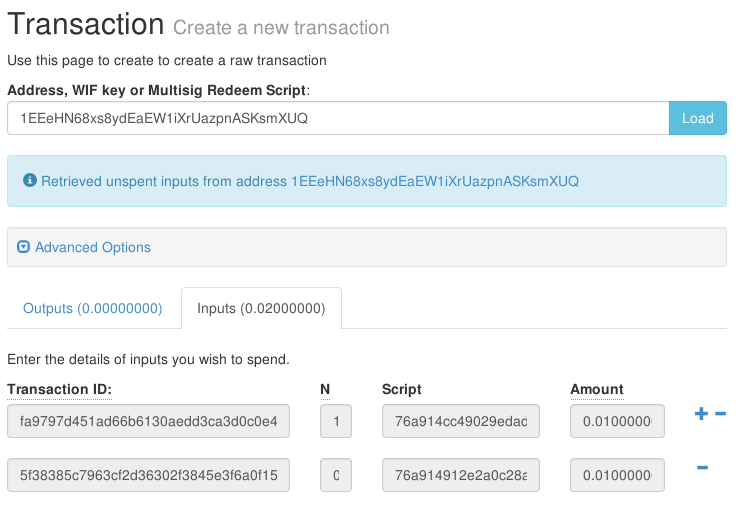 Enters Transaction Script and makes sure multisig address and true amount of money are in Outputs (pic). Alice selects Sign in Coinbin menu (pic). 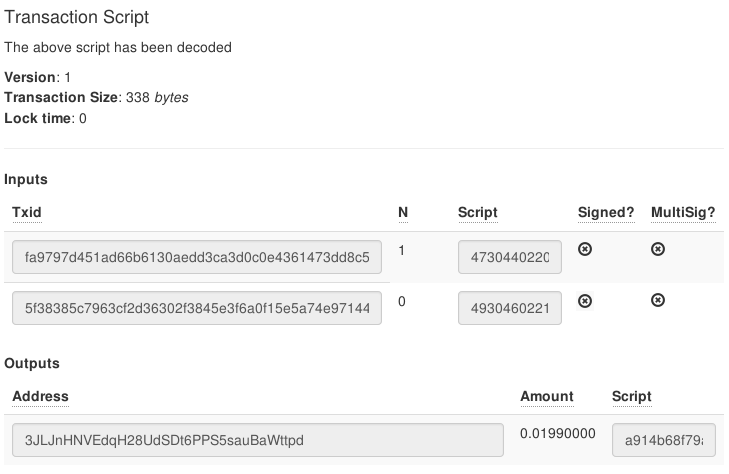 Alice enters Transaction Script and her private key (pic). Alice gets partly signed transaction and sends it to Bob (pic). 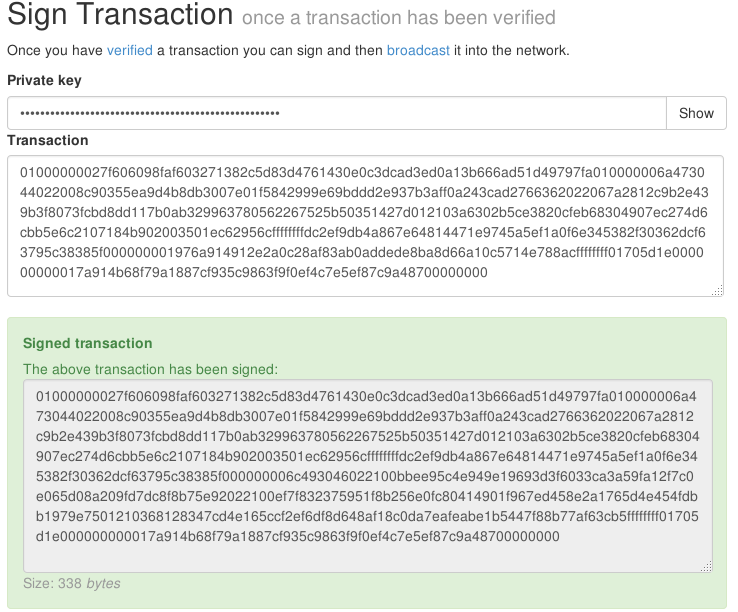 Bob verifies the transaction one more time and makes sure output address (multisig) and amount of money have not changed. Bob completes signing the transaction (same actions like for Alice part of signing, but uses partly signed Transaction Script instead of original one) (pic). 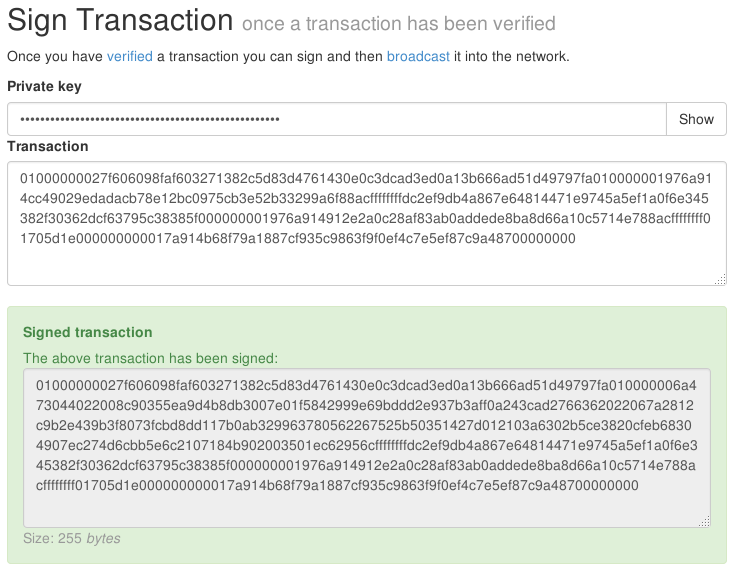 Bob verifies the transaction one more time and makes sure column Signed is marked for each row (pic). Bob selects Broadcast in Coinbin menu (pic). Bob enters Transaction Script and presses Submit (pic). The money has been deposited and they can switch to the deal itself. If the deal fails, both parties lose deposited money. (This is the whole point, making another party conscientiously fulfill the conditions of the deal under pain of losing money.) If the deal succeeds, parties move the money back from the deposit to their personal wallets. This is possible only if both parties agree. 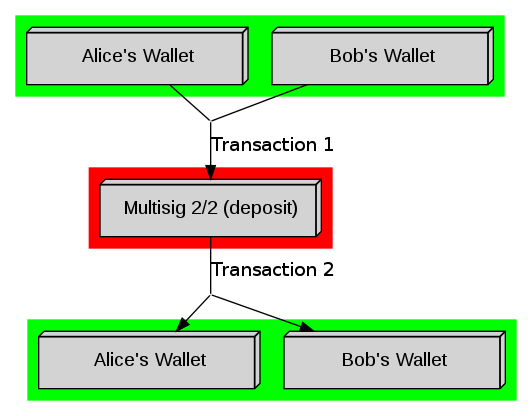 Alice creates a transaction moving money from the multisig 2/2 address to personal wallets of Alice and Bob. Bob signs Transaction Script and broadcasts the result. The money has been moved from the deposit back to personal addresses of Alice and Bob. The deal is over. The algorithm described acts as fraud protection for any deal. It doesn’t introduce third parties as traditional methods do, and overhead is almost nothing. The algorithm is not complicated even if it looks so. I mastered the technique after two “deals” with myself. Improvements of the algorithm and software implementation are welcome.